Treat your near and dear ones in an exclusive way with this Delightful Gift Hamper Basket with Various Products and make them feel very special. 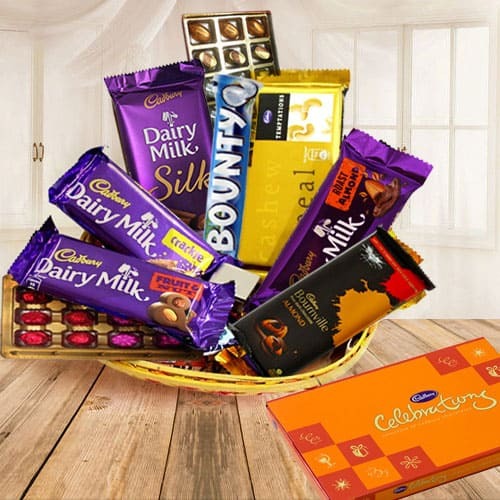 Send sweet surprise to your loved ones by gifting this Basket Hamper which is garnished with 24 pcs Homemade Assorted Chocolates, Cadbury Big Celebration, Cadbury Diary Milk Silk, Temptation, Cadbury Diary Milk Roast Almonds, Cadbury Diary Milk Fruits N Nuts, Cadbury Diary Milk Crackle, Cadbury Bournville and 100 gms Homemade Assorted Chocolates. Flowers Delivery Jodhpur, Send sweets Namakkal, Wedding Cake Udupi, Diwali Mithai Kasargode, Send Flowers and Gifts to Khanna, Online Shop Thrissur, Flower to Delhi, New Year Flowers Belapur , Fresh Fruits Bhatinda, Send Gift Modinagar, Dry Fruits to Ankleshwar, Birthday Delivery Madhyamgram, Sending to Ambala, Flower shop Barrackpore, Jalna Online Cake Delivery.